San Antonio's River Walk is a tourist's paradise. You will find shops, restaurants, and hotels lining the San Antonio River. With river-side sidewalks, stairs to the street level, pedestrian bridges, historic sites to tour, and boats floating lazily down the canals, you will find plenty to enjoy in this area of San Antonio. In late November, the River Walk takes on a holiday glow. The colorful lights along the river will put you in the holiday mood. At 7 p.m. on the Friday following Thanksgiving, the switch is thrown and approximately 122,000 twinkling lights form a magical canopy over San Antonio's River Walk. The lights shine brightly every evening through January 6, 2019. The lighting ceremony is the official kickoff to the Holiday Light Fest with tickets available online. There is some free seating available on street-level and the website lists restaurants that host special parade dinners. For over 20 years, the spectacular one-hour parade along San Antonio's River Walk features decorated, illuminated floats with celebrities, bands, and lavishly-costumed participants. Over 150,000 people will gather along the River Walk to watch the spectacle live along the parade route. After 4 p.m. the day after Thanksgiving, the River Walk is accessible only with a ticket to the parade. Beginning the next day, the River Walk is open without a ticket. In December also enjoy the Fiesta de las Luminarias. 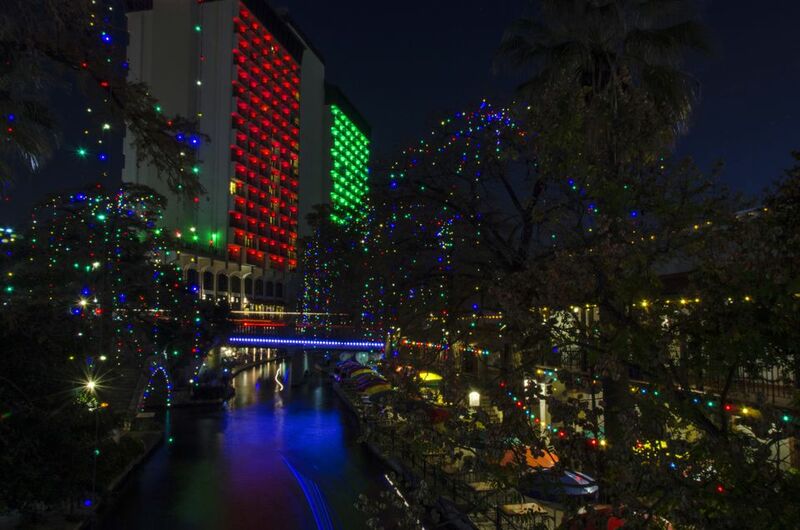 You'll experience the peaceful flow of the River Walk as you stroll along the beautifully planted banks of the San Antonio River guided by more than 2,000 glowing luminarias. The traditional glowing candles in sand-filled bags line the walkways to symbolically mark the "lighting of the way" for the Holy Family. This centuries-old tradition begins at dusk on selected Fridays, Saturdays, and Sundays only. The lights dance above you in joyful color. Who wouldn't be uplifted by a visit to San Antonio's River Walk at holiday time? You can enjoy walking or just sit at an outdoor cafe sipping a Margarita (yes, the weather is that mild) and watch the world float and walk by. But for a real treat, consider dinner on the river. There are several River Walk restaurants that offer dinner on the River barges, such as Boudros, one of the top restaurants on the River Walk. Those with a reservation for the Boudro's dinner cruise will board the boat just in front of Boudros. The staff will take orders for entrees before you set off on a short cruise, arriving back to the restaurant to enjoy the main course and dessert. Boudro's serves their famous fresh guacamole before you set sail down the river for a narrated cruise. Enjoy the scenery along with appetizers and salad, as the boat makes a short loop back to Boudros to serve the main course, piping hot from the kitchen. You'll then set sail again down the river, treated to the entrancing colorful lights hanging from above. Throughout the trip, you'll be serenaded by boatloads of carolers and bands. From the banks, you can hear the strains of Mariachi music, all making for a magical evening.